'The City in Literature" charts the origin and the evolution of the city from ancient to modern times. It is concerned with the rise of the city as an Enlightenment construct and the various literary responses to the new secular city from Defoe to Pynchon and his contemporaries. The transition from the eighteenth to the twentieth century involves the move from an agrarian to an urban realm and the rise of commercial andindustrial institutions. These changes resulted in the loss of the modernist self, no longer the product of memory in a world aesthetically or otherwise centered, and the loss of mythic meaning as it gave way to the uncanny and a maze of mystery. In Europe, a commentator like Spengler tried to hold on to an exhuasted past, and in America the literary imagination gave consent to Jeffersonian values long after they were unrealizable. Both the city and the literature are textualized here: the literature is read in terms of urban modes, and the city in terms of literary modes, one paradigm informing and illuminating the other. Comic and romantic realism give us responses to the commercial city, naturalism and modernism to the industrial city, and postmodernism to the postindustrial city. Subgenres--the utopian novel, the gothic novel, the detective story, the young-man-from-the-provinces novel, the novel of imperial adventure, Western, science fiction, and dystopian narratives--inform the historical moment, depicting the rise and transformation of the city. 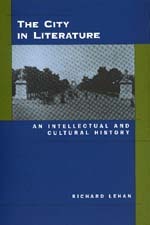 The book treats the city as abstracted from the works of Defoe, Dickens, and the Gothic novel; Hugo, Balzac, and Zola; Baudelaire and decadent literature; the popular expressions of Conan Doyle, Rider Haggard, Stoker, and Wells as well as the high modernism of Eliot and Auden, Joyce and Beckett. Two other chapters read the city against the rise of imperialism and totalitarianism. The book also reads the American city against the wilderness and the rise of the frontier; treats the novels of Norris, Dreiser, and F. Scott Fitzgerald; and focuses on depictions of New York and Los Angeles. Two concluding chapters treat both the movement of the city west and the rise of postmodern paradigms. An epilogue looks at the city's "future." This sweeping literary encounter with the Western idea of the city moves from the early novel in England to the apocalyptic cityscapes of Thomas Pynchon. Along the way, Richard Lehan gathers a rich entourage that includes Daniel Defoe, Charles Dickens, Emile Zola, Bram Stoker, Rider Haggard, Joseph Conrad, James Joyce, Theodore Dreiser, F. Scott Fitzgerald, and Raymond Chandler. The European city is read against the decline of feudalism and the rise of empire and totalitarianism; the American city against the phenomenon of the wilderness, the frontier, and the rise of the megalopolis and the decentered, discontinuous city that followed. Throughout this book, Lehan pursues a dialectic of order and disorder, of cities seeking to impose their presence on the surrounding chaos. Rooted in Enlightenment yearnings for reason, his journey goes from east to west, from Europe to America. In the United States, the movement is also westward and terminates in Los Angeles, a kind of land's end of the imagination, in Lehan's words. He charts a narrative continuum full of constructs that "represent" a cycle of hope and despair, of historical optimism and pessimism. Lehan presents sharply etched portrayals of the correlation between rationalism and capitalism; of the rise of the city, the decline of the landed estate, and the formation of the gothic; and of the emergence of the city and the appearance of other genres such as detective narrative and fantasy literature. He also mines disciplines such as urban studies, architecture, economics, and philosophy, uncovering material that makes his study a lively read not only for those interested in literature, but for anyone intrigued by the meanings and mysteries of urban life. Richard Lehan is Professor of English at the University of California, Los Angeles. His books include The Great Gatsby: The Limits of Wonder (1990).